I subscribe to NY Times which I receive and read regularly. They often include recipes which I always look at. Last Sunday featured a good series of chicken recipes. 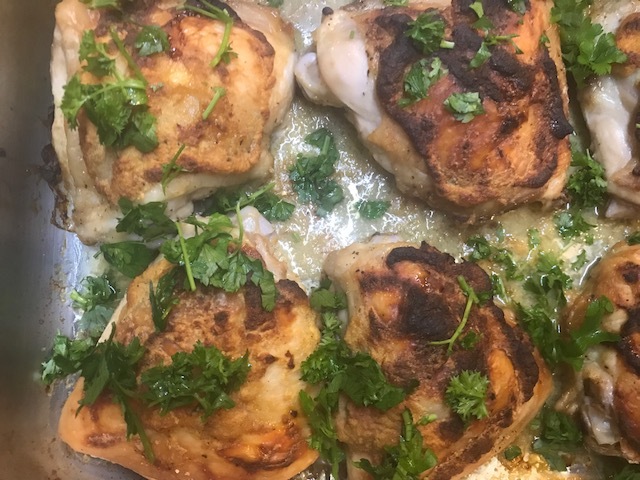 I choose Devilled Chicken Thighs because I was easy and I could easily modify it. Following is the result which was easy for Mike to make as I wasn’t feeling 100%. They were great for dinner and the left over piece still had plenty of flavour the next day for lunch. The term ‘devilled’ has several meanings but most often applies to a food with a sharp flavour mostly derived from mustard, vinegar, cayenne or other chilies. In this recipe I use both mustard and chilies for the sharpness. I used thighs but breasts or whole legs would also be fine. Heat the oven to 180C or 200C. Combine the chopped onion, mustard and chillies in a bowl, mix with a stick blender. Keep mixing until the onion becomes smooth. Lightly season the chicken pieces with salt and pepper. Spread the mustard mixture over both sides of the chicken pieces and place them skin side up in an oven dish. Cook for about 30 minutes. Then add the chicken stock for about 10-15 minutes or until the chicken the ready. The stock gives good juices to serve with the chicken. Serve topped with finely chopped parsley and with rice, potatoes or kumara.